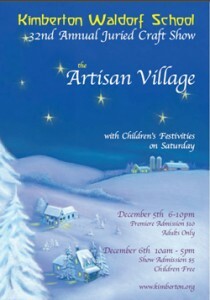 This year’s theme for the Juried Craft Show at the Kimberton Waldorf School in Kimberton Pa is the “Artisan Village”. There will be over 70 fine Artisans presenting their Textiles, Jewelry, Pottery, Woodwork, Metalwork, Gourmet Foods and Handmade Toys. There will be Fine Dining, a Tea Room, Live Music and a Silent Auction! Village Workshops(grades 1–8)-Candle Making, Crafting and Soapstone Carving.